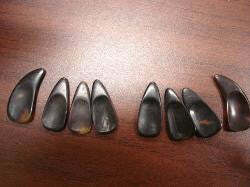 These are grooved picks for comfortable wear. 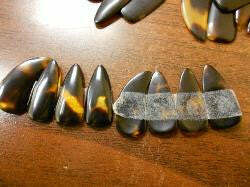 The picks are grooved underneath to fit right onto fingers. These picks are thick with well-filed rounded edge. Superior quality filing. If you want thinner picks, please request through email. If you have any color preference, please specify in the order. eg. darker color, reddish color, mix color. Normally darker color means more density.